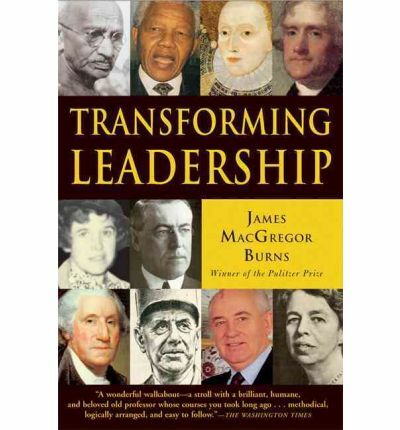 In 1978, Pulitzer Prize and National Book Award-winning historian James MacGregor Burns published Leadership, a seminal book dealing with how leaders interact with society and through their efforts have the power to shape the course of history. The book became the basis for an emerging field of leadership studies that has been applied throughout the social sciences as well as in business and government. Now Burns has returned to the subject, offering a new vision of leadership-Transforming Leadership-that focuses on the ways that leaders emerge from being ordinary "transactional" brokers and deal-makers to become real agents of major social change who empower their followers. Through the course of the book, Burns illuminates the evolution of leadership structures, from the chieftains of tribal African societies, through Europe's absolute monarchies, to the blossoming of the Enlightenment's views of liberty that came to fruition in the American Revolution. Along the way he looks at key moments in leadership, and the great leaders who made them, including Cleopatra, Elizabeth I, James Madison, Napoleon, Mao, Gandhi, and Mikhail Gorbachev. Part One: ChangeChapter 1: The Mysteries of Leadership An introduction to Burns' concept of leadership-how leaders differ from tyrants, and transactional leaders from transforming leaders-and how this differs from other "Great Man" views of history. Chapter 2: Searching for the X-FactorLooking at his own studies of FDR and other leaders, Burns looks at how change emanates from society, and how this shapes community and society. Leadership is the "X-Factor" that brings change from concept to social reality. Part Two: LeadersChapter 3: Kings and Queens, Knights and Pawns Using the game of chess as a metaphor for leadership action in monarchical society, Burns looks at the leadership systems of African tribes, and how monarchy evolved to the absolute model in post-Renaissance Europe, with a portrait of Elizabeth I's successful leadership during a turbulent period in English history. Chapter 4: Leaders as Planners A look at transforming leadership outside the political arena, including the building of the Suez and Panama Canals and Charles Eliot and the making of Harvard University into a world-renown institution. Part Three: LeadershipChapter 5: The Transformation of American Leadership A look at the American Revolutionary Period, and how leaders like Jefferson, Hamilton, and Madison created the Declaration of Independence and the Constitution that first brought to political life the 18th century enlightenment ideals of "Life, Liberty, and the Pursuit of Happiness"-from the foundation of America's political culture to the formation of America's political parties. Chapter 6: France: Trials of Leadership How the French Revolution, begun in the spirit of "Libety, Equality, and Fraternity" spun out of control because of the leadership failures of men like Robespierre-and how it ultimately resulted in the military strongman Napoleon coming to power, with dire consequences for Europe. Chapter 7: Leadership as Conflict Burns argues that conflict is an essential component to getting beyond transactional leadership into transforming leadership-that ideals and ideas must clash to yield continuing and meaningful social change. He looks through the historical prism of the 19th century Tory Party's "Loyal Opposition" in Britain (to view its success) and Gorbachev's Perestroika and Glasnost initiatives of the 1980s (and why they failed). Part Four: PeopleChapter 8: The Anatomy of Motivation A look at the human causes behind the necessity for social change, what the great thinkers have had to say about it from Rousseau to Marx, and how wants become needs that create demands for change. Chapter 9: Creative Leadership From da Vinci to Einstein, the genius intellect has been able to transform our understanding of the world through his or her creative vision. Burns argues that creativity is an essential part of building coalitions and finding solutions for the problems we face, and profiles Gandhi's creative leadership in India against the British Empire as a prime example, as well as how societies can encourage the creativity necessary to foster positive change. Chapter 10: The Leader-Follower Paradox Presents the Burns Paradox: If leadership and followership are dynamically intertwined, is there really any way to begin understanding their interaction? He argues that leadership begins with the followers, whose wants and needs become expressed through the intervention of leaders who can articulate them. Burns explores this further through the prism of FDR's New Deal program and re-election effort in 1936. Chapter 11: Conflict: The Arming of Leadership Burns argues that great leaders seek out conflict, and how leaders from Martin Luther King Jr. to Nelson Mandela have created enduring change by engaging forthrightly in political conflict. PARTTTTTT FIVE: TransformationChapter 12: The Power of Values Citing examples as diverse as Eleanor Roosevelt's championing of the Universal Declaration of Human Rights and the Avignon Papacy's enduring leadership of the Church following its exile from Rome, Burns shows how creating lasting values is the hallmark of enduring leadership. Chapter 13: The People, Yes? How intellectual and creative leaders must engage with the people to forge transformation in our society, including examples like the Tennessee Valley Authority. EPILOGUE: Global Poverty: Putting Leadership to WorkIn a provocative culmination of his examination of leadership, Burns proposes a leadership challenge to the foremost problem facing humanity in the 21st century: global poverty. He outlines an international UN-led initiative for a grass-roots campaign to promote development throughout the impoverished nations of the world, based on the successful model devised and operated to provide low-cost community healthcare in India.